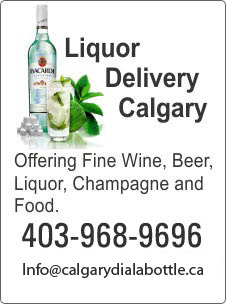 Dialabottlecalgary.ca is an online portal which serves seven cities and is the largest liquor delivering service. We are specialists in door to door delivery of beer, spirits, wine, champagne, liquor as well as fast foods which include Pizzas, burgers, fries and so many other favourites. We deliver all these within an hour and too for all possible occasions. Dialabottlecalgary.ca is not among the leaders but "the leader" when it comes to ordering fast food or liquor or even gift delivery in the city of Calgary. Having years of experience in the industry, Dial a Bottle Calgary have well trained staffs who are familiar with the city and thus are able to deliver in any part spot on time. Our customers often use our Dial a bottle service for ordering liquor at their door step. We provide the best quality of liquor within just an hour at our client's door step. Our liquor range includes exotic wine or drinks, and our clients can order almost any type of liquor ranging from beer or wine to spirits. Their wish is our command and we deliver the best quality of the specific liquor type requested by our clients and that too at unmatched price. We not only have a tie-up with a number of good liquor stores but we also make sure that the liquor is cold and well packed when it reaches the client. We also have a team of experts who assist clients by providing useful tips on how to enjoy their drinks and food in the best way. Our fast food delivery service makes sure that the food reaches the doorsteps of the client fresh and hot and we maintain a strict standard of quality and leave no stone unturned to ensure that our clients get only the best delicacies available in the city. We also make arrangements for special menus if requested by our clients and take orders for special occasions like birthdays, anniversary parties, business meetings, corporate events and other celebrations too. Another of pour popular service includes gift delivery in the city of Calgary. Our clients can gift from a large variety of liquor available with us. We pick up the right bottle of alcohol and the wrap it up nicely to deliver it to the place the client wants to be delivered. Thus we make the entire process very smooth and hassle free for our clients. Dial a Bottle has made buying or gifting alcohol or fast food extremely easy for the residents of the city.